In Malaga today we talk about 4K technology, or what is the same thing, Ultra High Definition Television. 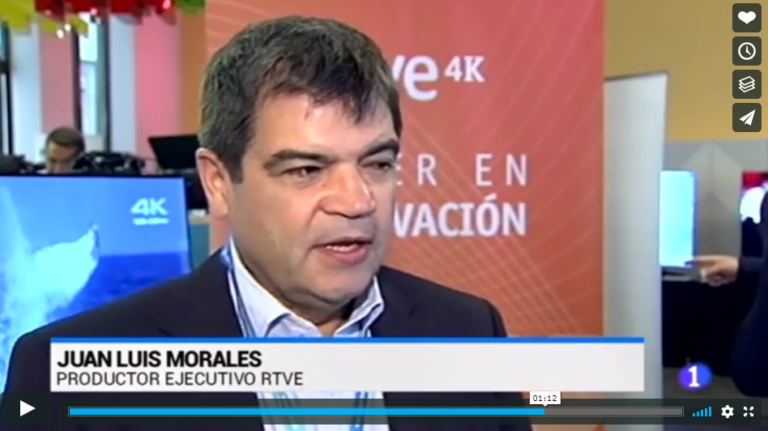 Experts from 20 countries will meet at the 4K Summit, where RTVE is today the absolute protagonist. 4K technology is as close to the vision of the human eye as if we were multiplying the quality of High Definition by 4. According to Belén Molinero, director of the series “Ciudades Patrimonio” of RTVE: “It is a brutal quality, where details are appreciated superbly and a quality of sounds and possibilities that means a step forward in the world of television”. Contents such as the changing of the guard of the Royal Guard and documentaries about the Prado Museum or the Reina Sofía Museum or the series of 15 chapters on World Heritage Cities are some of the 4K productions made by RTVE that will be presented this afternoon at the 4K Summit. Juan Luis Morales, executive producer of RTVE: “The recordings are a little slower, more delicate because of the quality of the resolution of the image. The decorations are also more delicate and the make-up is more delicate”. This and much more will be discussed until next Friday at the 4K Summit, a forum that brings together experts from 20 countries to discuss the present and future of television.